Literary Agents. When you read those two words what happens? Do you feel excited? Do you feel dread? Does your head start to ache? Finding the perfect agent doesn't have to be a struggle. All you need are some good tracking skills and the right bait. Annette Fix is ready to show us how to set the net in her upcoming class The Hungry Writer's Guide To Tracking & Capturing A Literary Agent: How to Get the RIGHT Agent for Your Manuscript. 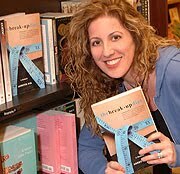 Author of The Break-Up Diet: A Memoir, Annette has experienced first-hand the frustration of chasing down that agent. Her own experience led to perfecting her specific technique which she now teaches at writer's conferences and is offering to us through WOW! Workshops & Classes. Limited to 10 students, How to Get the RIGHT Agent for Your Manuscript begins on Monday, August 2nd and runs for 4 weeks. You probably remember Annette as she is the former Senior Editor of WOW! She is with us today to talk a little bit about her upcoming class, common mistakes, and what it takes to find the right agent. WOW: Hello Annette, it's fun to have you here with us today. I love this image of you at the bookstore posing with your book, what an inspiring picture for all of us. Annette: Thanks. It was definitely exciting to see my book on the shelf for the first time. I found it very difficult not to grab someone passing by, point to the book and say, "Hey, look! That's me! I wrote that!" WOW: LOL, you look very happy. We are talking today about your upcoming class on finding the right agent for our manuscript. When is a writer ready for an agent? Annette: When the writer has a completed, polished manuscript that is as perfect as she can possible make it, then she's ready to approach an agent. Never pitch or query an agent until you've completed and polished the manuscript--unless you are writing nonfiction, in which case, you need a completed and polished book proposal in lieu of the book manuscript. WOW: Our project should be ready to sell then, before we send out any query letters. Writing a great query letter is an art in itself; what is the most common mistake you see regarding agent queries? Annette: There are two mistakes that are most common. The first is when the writer uses the shotgun approach--sending out queries to any and every agent who accepts submissions for the genre in which the author writes. The agent listings in certain well-known publications are not the best place to find the right agent. The writer needs to research agents who are currently signing and selling books similar to what the writer has to offer. Querying is not a numbers game; it's very specific and strategic. That's the only way to avoid a muse-killing flood of rubber-stamp rejection letters. The second biggest mistake is not crafting a concise query letter that hooks the agent, and clearly conveys the story premise and the writer's voice. The query letter is a sales tool, not a story synopsis. Many writer's take off on plot tangents, introduce too many characters, and give too many details that make the storyline difficult to follow. The query letter should come in around 250 words from "Dear___" to "Thank you for your time and consideration." WOW: Talk about making every word count! A new writer with little to no previous publishing experience may be anxious about how to represent herself. How important is it to an agent that the writer has a list of publishing credits? Annette: Agents want to be able to pay their bills and stay in business doing something they love, so their primary interest is whether or not you have a manuscript they can sell--and long term--if you will continue to write manuscripts they can sell. Writers need to focus on fulfilling that desire--and their own. Don't worry about previous publishing credits. Every writer starts out with none. If you have publishing credits, you can certainly include them; depending on the credits, they may add credibility--like if you've been published in The New Yorker. But previous credits are not necessary. With fiction and memoir, you need to be a good storyteller--the manuscript is Queen. For nonfiction topics, you need an established platform and expertise in your field. And it certainly helps, both for fiction and nonfiction, if you have an online presence, though you don't need to mention it in the query unless it directly relates to your topic. WOW: In addition to the written query, you also work with students in perfecting a quick, in-person presentation or "elevator pitch." What information should be included in the pitch? Annette: The pitch capsule should include the title, genre, and premise in about 50 words or less. A writer needs to be able to deliver it--pitch aloud--in the hall between conference sessions, at a round table meet-the-agents session, during networking mixers, or any time they have a spare moment with an agent. With the pitch, less is more. All you want to do is hook the agent enough to have her ask you to submit your manuscript. That's it. The more you talk, the more you talk her out of wanting to read your manuscript. If her eyes are glazing over while you're still telling her about all the turning points in your plot, you've already sunk your submission ship. WOW: With all this talk about how to find an agent, some writers may wonder how agents are compensated. Annette: Agents typically receive 15% of any advance and royalties. WOW: That seems reasonable, especially considering the big houses work almost exclusively with agents. Annette, you've been teaching this course for a while; do your former students stay in contact? Do you have any success stories you can share? Annette: Most of the students I've had have been so eager to begin searching for an agent that they've jumped the gun a bit: they didn't finish writing their manuscripts before taking my class. On one hand, it allows them more time to feel out the market and monitor what is selling (and who is selling it). On the other, it's not a good thing if they intend to put it to use immediately. I strongly advise against approaching agents before the manuscript is completely polished--which is often several months (or more) from the time the first draft is complete. I have had success stories that I've heard from two writers who worked diligently with me to craft their in-person pitches. Their final products resulted in agents requesting to read their manuscripts. No word as to whether they were offered representation. Of course, that depends solely on the strength of the manuscripts. WOW: That's wonderful! The request of the manuscript for reading is the success. What should your students expect to come away with from your class? Annette: Students will definitely come away with a solid understanding of what it takes to get in the door with an agent. You can have an amazing manuscript, but if you don't approach the business side of publishing in the right way, no one will ever read it. After my course, students will be able to pitch their stories in a succinct and compelling way, write a concise and engaging query letter, and know how and where to find the right agents. That's what it will require to move their writing careers to the next level. WOW: For those of us serious about selling our manuscripts, this four-week class could save months of frustration, leaving us with time and energy to spent on our next book! Thank you, Annette; it's been a pleasure talking with you. How to Get the RIGHT Agent for Your Manuscript is limited to 10 students. This is a popular class, so sign up today while there are still openings.